Well, it’s been some time since my last newsletter was sent back in January. My intention was to get a newsletter out by the end of April; however, as an expert in procrastination, the issue of “On the Beaton Path” is 3 months late. As many of you know, I am a crazy football (soccer) fan and was glued for a month between the middle of June till the final on July 15th watching the World Cup. Right after that I had to watch “The 147th Open Golf Championship” from Carnoustie, Scotland. It brought back fond memories of playing that course. There have been a couple of health issues affecting me since January. The volume of my voice has become so weak that now I have a microphone headset with an amplifier/speaker which enables me to communicate with the people around me. Secondly, I am unable to swallow, and I am a high risk to aspirate, so all of my food, water and medicines are given to me through a tube inserted in my stomach. Over the next few months, I am doing exercises to pass the swallow test scheduled in September which will enable me to taste food again. The thought of not being able to enjoy a good haggis breaks my heart! Other than that, I’m doing well. 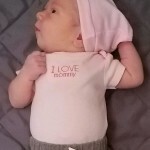 On the 17th of July, Linda and I became grandparents for the first time when her son John’s wife, Stephanie, gave birth to a baby girl named Maggie James Polston. What a beautiful baby. Maggie weighed in at 7 pounds, three ounces and is 20 inches long. As a gift I gave my children’s CD “Kidding Around” to Maggie which should provide her great pleasure for many years to come. You, too, can make a young child happy by giving them this wonderful CD. As always, I am TOTALLY shameless! This past Friday Linda, Jeff Paul (a friend) and I attended Ashley’s graduation from college. As you may remember, she worked for me for 3 years as my caregiver and lived with Linda and I for the last 2 years she was in nursing school. 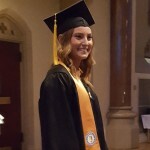 It was with mixed emotions that I watched her walk across the stage: I am so proud of the beautiful young woman she is and what she’s achieved in getting her nursing degree, nursing license and securing a full-time job, but at the same time, both Linda and I miss her terribly…she became a member of our family and it was like watching your child leave the nest. I would like to thank my dear friends who sell my CDs at numerous Highland Games. On Labor Day weekend I will have a table by the Glenfinnan Stage at Pleasanton, California. The following weekend, my table will be at my good friend, Seamus Kennedy’s, tent in Estes Park, Colorado. On the second weekend of October, you will find my table at the Alex Beaton Stage in Ventura, California. I was running out of stock for a number of my CD’s. Because of requests for these selections, I have ordered and received a small amount of product. Now, most of my CD’s are available on the store page on my website: www.alexbeaton.com. You should think about birthday and Christmas gifts along with enhancing your own library. Again, I’m shamelessly hawking my wares. In closing, there will be no comment on when the next edition of “On the Beaton Path” will be available. Like myself, don’t give up hope. Thank you for your love and support; I can’t believe that it has been 7 years since my accident. It’s been a great comfort to know that I am not forgotten as I haven’t forgotten you either nor the pleasure it gave me for all those years to travel throughout the country performing live for my fans and friends. There are 10 comments . Alex, what blood type in Linda’s brother? Of course you are not forgotten at the Highland Games or even at the Renaissance Festival. Anytime I hear the Scotsman I go I remember the first time I heard that was Alex Beaton performing it. I am also eternally grateful for the non-traditional bands who you helped promote over the years including brother. Tell Seamus he should sell your CDs at the Oklahoma Scottish Festival. Neither you nor Linda are ever forgotten by me. I was fortunate to be invited to a party in Scotland this month where my friend rented the entire gorgeous castle in Ayrshire (called Glenapp) and we pretended we were the Downton Abbey cast. After that glorious weekend I went to Iona and Staffa, where I achieved my bucket list desire to see Fingal’s Cave. I spent a couple of days in the Appin and Glencoe area too (always my favorite). It was a dream. And the entire time you accompanied me. My enjoyment of Scotland has always been immeasurably enhanced with the soundtrack of your music, which I have loved for nearly as long as I have loved Scotland. Thank you so much, and always my gratitude to Linda for taking such great care of you with the kind of generous, unconditional, selfless love that most of us can only ever dream of. You are both incredibly fortunate. I’m always thinking of you both and you are always in my prayers. We continue to pray for you both and hold you dear in our hearts. Both of you have been pillars of strength and models of grace and patience through your trials. What a wonderful, blessed example you are for us! In addition, you are still concerned about the well-being of others. You are tireless champions of positivity, and have surely earned your heavenly crowns. We love you both and ask God to bless and keep you. Aye Alex, I keep a picture in my office of You and I at the Estes Festival in 1992. Each time I see your smiling face, I pray for your speedy recovery. Stay strong, and I hope you get to taste the haggis soon. Alex, it’s November now, and I checked your website today as I am just downloading all of your CDs onto my new tablet so I can enjoy your music everywhere I travel. I became a huge fan when I first enjoyed your music at a Robbie Burns Dinner in Bakersfield, CA. I keep you in my prayers. Congratulations of the new grandbaby. I love you and I love Scotland. I spent some time in the Machars researching a magazine article I was writing. Over the years I’ve seen you perform a number of times (always at the Costa Mesa Highland Games) and on one occasion I brought my parents. Your music has always touched my heart deeply ❤️ Congratulations re: Maggie — truly a blessing. Have a MERRY CHRISTMAS and a healthy, happy New Year. I will never forget you, my brawny Scotsman!